Like most of you, as the end of the year approaches our conversations are turning to recapping the successes and challenges of the year, as well as looking ahead and making plans for 2016. A big part of our reflection and planning includes talking with our clients, friends, and mentors about how we’ve done and what we can do better. In pursuit of those lessons, I spent last week visiting with one of Plenty’s key clients. We walked through the year in review, and as we did we were able to take a rare opportunity to sit back and marvel at the results. Over the last eighteen months, we’ve helped completely revitalize one of their major peer-to-peer programs. Before we came on board, the program was in significant distress. The number of participants was declining annually, costs were increasing, the return to charity was getting hard to justify, and the culture of the team of staff and vendors was glum and self-defeating. A year and a half later, we’ve helped create a 15% revenue increase and an even larger increase in net income. As we launch the 2016 season we are forecasting substantial growth in the year ahead. All told, the net income lift was well into the millions of dollars, and the client’s ROI on Plenty has been astronomical. The client is thrilled, we’re thrilled, the beneficiaries are thrilled, and the participants are thrilled. I took a second to absorb the question, and opened and closed my mouth a couple of times trying to get my head around the answer. Here’s the simple truth. When I think of what we did to create multimillion dollar growth, I can’t point to one component and say, “That made all the difference.” In fact, the defining characteristic of our work is that it was not one specific thing. I’d love to tell you that it was better segmented e-communications (which helped), or the branding work (which was critical), or audience analytics and better targeting (indispensable), or some other specific component. But while tweaking or even overhauling one of those items may give you a more optimized program, if you are truly looking for 15% growth on a program that is flat (or declining), in an economy that doesn’t seem to realize it has turned around, in a charity space that is more competitive than ever, you’ve got to be ready to turn over every single stone in a sustained, coordinated effort. We realigned the program around the organization’s core objectives, which included presenting a case to the board about what those objectives should be, how we should measure them, and why the program deserved to exist in the first place. We ran extensive audience analytics to understand the changing base of the program and the changing landscape of the space, and then worked closely with the client and their marketing agency to completely rebrand the program around an image that would appeal to that demographic. We helped implement a revitalized media campaign and streamlined the website to focus on the core elements of the program. We went through costs and program elements like misers with fine-toothed combs. We brainstormed, pushed, cajoled, and otherwise worried and worked to find cost efficiencies and innovation in every aspect of the program. We retrained the entire staff around the basics of asking, and reduced participant materials to those that were most impactful and effective. We implemented vastly improved metrics, tracking, and trend forecasting to show - ahead of time - what was working and what still needed help. We worked side-by-side with the client to literally rebuild the culture of the team from the ground up, putting in place a new set of values, a new vision statement, and agreements on how we would conduct ourselves. And most of all, we did it in partnership with a team of great people at the organization and across a group of partners and agencies. It wasn’t easy, but the results have made everyone proud. "Everything" can feel overwhelming. 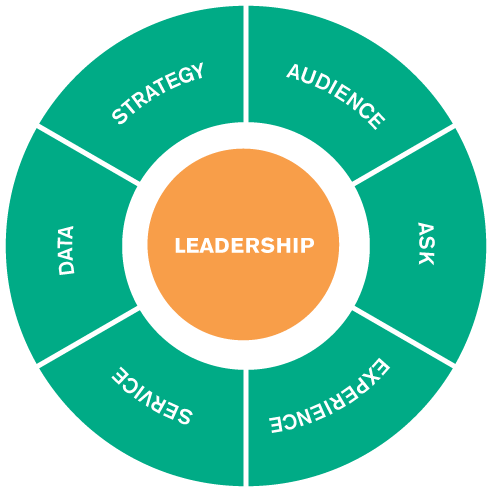 Learn where to begin using our Seven Success Factors framework. Download your free copy below!